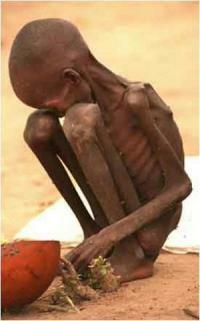 Famine in East Africa: Failed Systems and Leadership or a Natural Catastrophe? During the past few weeks, we’ve seen countless stories and images of the famine that’s gripping East Africa on several media outlets—from cable news shows to online discussion forums. The crisis affecting Kenya, Somalia, Ethiopia, Eritrea, and Djibouti has shown us deeply disturbing and heartbreaking images of starving families and dying children living in extreme poverty. It is difficult for any citizen of the world, any government, or any world organization to ignore the urgent call to help the people of East Africa. Despite these disturbing stories and images, some government officials in East Africa don’t see the region as plagued by severe famine. Several government officials in Eritrea are in denial about famine in the region as families there suffer in silence, according to the Huffington Post. In Kenya, government officials such as Public Communications Secretary Dr. Alfred Mutua has denied the famine situation in some parts of Kenya, according to The Standard. Kenya’s Special Programmes Minister Esther Murugi recently called upon the international community to stop refugee entry into Kenya citing national security concerns and restrained resources, according to the Sunday Nation. Upon reading this, my first reaction was that it would be very unfortunate if Kenya closed its borders to starving families from Somalia, especially when there is enough capacity to accommodate them. Being a parent, I tried to put myself in the shoes of one of the refugee parents and felt that there appears to be no reason good enough to turn away families that are starving and seeking very basic human needs—food, water, and safety. Having had a chance to volunteer with CARE Kenya Refugee Assistance Project in Dadaab in the mid-1990s, I remember there were three camps—Hagadera, Dagahaley and Ifo—that accommodated the refugee community. I wonder whether they are now all filled to capacity to warrant calls to stop refugees’ entry into Kenya? While I cannot claim to have a complete understanding of the situation in Kenya or Somalia, I wonder whether Murugi’s proposal takes into account that there has been ongoing civil conflict in Somalia with some regions being controlled by militia that make some families in need as well as humanitarian agency workers feel unsafe in these areas? My friend, Mkawasi Mcharo Hall, recently quoted a 1969 speech by Mwalimu Julius Kambarage Nyerere, the first President of Tanzania, on her Facebook page: “If a door is shut, attempts should be made to open it; if it is ajar, it should be pushed until it is wide open. In neither case should the door be blown up at the expense of those inside.” The last sentence of this quote expresses the complexity I feel in my reaction to Murugi’s proposal. While I agree that the “door should not be blown up at the expense of those inside,” I also wonder what the situation might look like if starving families had to be turned away to preserve the well-being of those inside? I still ponder this complexity. I wonder what could have been done differently on many levels—among individuals, communities, societies, and nationally—in Kenya, Somalia, Ethiopia, Eritrea and Djibouti that might have prevented this humanitarian crisis? While lack of rain is a contributing factor, I wonder whether specific lessons—current and past—might have been missed or ignored that could have averted this crisis? In his article, “Africans Must Say No to Famine Episodes,” Kenya’s James Shikwati of The African Executive cited failed systems and poor leadership as problems that led to the current crisis—problems that must be addressed by the affected countries to help prevent future crisis. Our lives here in the U.S. are a complete contrast to those of many people in East Africa. I was baffled when I watched a recent food eating competition on the local news—the contrasting images of competitive eating participants and people starving elsewhere across the globe paint a picture of disconnect. While I admit that personal assumptions and biases influence my thinking here, I wonder how the disparity that is so evident might be bridged? I just find these contrasting images irreconcilable on many levels. I wonder what can be done differently on a personal and collective level so that we can modestly partake in what is available to us—if only for personal well-being and, at best, also in support of the collective. Regardless of who or what has systemically failed to yield to the call of effective leadership, service, or meeting expectations and, despite the complexity involved and the diversity of our value systems, it is clear that some children of the human family are in dire need. Whatever help we can provide will make a difference and may literally save someone’s life.